Here is a real fun sport plane, if you are lucky enough to find one. The Midwest Super Hots 60. Arguably one of the best sport planes ever designed, it will take anything you can throw at it. Midwest made 3 sizes of the Hots and others have taken the design to produce giant scale sizes. Sadly Midwest does not produce this plane any longer, they are still floating around for sale every so often. I like mine as a sport plane to buzz around and enjoy the handling of a well build, well designed sport plane. Flies like a dream and looks good in the air. Ask an old timer if he remembers them. You are right! I have two. Have not flown in years but I have one in my garage. best flying plane I ever had. dam near impossible to stall. you can actually fly it backwards with a stiff head wind. I may just start back just to take this thing out to the field and watch the youngsters gawk. Powered by a Fox 74 with a pipe and controlled by an Ace 8000 am radio. Do you think I might get a few questions? I've been out of RC for 20 years and I will get back into it this year I still have a brand new Super Hots in the box that I can't wait to build. I am a hots fan have built two of the 60 size from plans. I never built one from a kit just the plans. I built three of the smaller hots and loved them. I am in the process of building a larger super hots. Got the plans scaled up so that the wing span is around 65 inches. I am going to go wit an electric and see how it goes. Yes please. I have one. Wish I can find a bigger one. Mine was in a prank. Rebuild now. I also wish that we will see them on the market again. Absolutely a great plane to have good fun. email. Hopefully to get a return contact about plans. I have one in storage from 1989 and just ran across another retired SH60 found on craigslist ! Best airplane ever! I still have my Hotts .60 with a ST .90 with tuned pipe. It was so much fun I built the little Hotts with a Fox .15BB with a MAC's tuned pipe, NICE! I quit flying in 1998 when we lost our flying field and my career took off. Not enouth time for everything. Anyway, I might try the Big Hotts with one of the new gas engines and scratch build the litte one for electric. I bought this from a friend and I have not been able to find any thing out about it. It looks very similar to the one here. I can send pics to anyone who knows anything about them to help me identify my oldest addition to my fleet. My brother was building one when he passed away in 2004. I've had thing for years sitting in my garage. I don't fly and was wondering if anyone was interested in finishing it. It's built, covered in white, however the engine needs to be installed and etc....Let me know!Can't seem to get a picture on this message but I got em if you want em. Flew one with an OS.90 & pipe a real joy. Having it rebuilt completely with a Evolution 10CC . Can't wait to see how it performs. This was a real show stopper in the late 80's. Probably one of the first 3D planes. Recently converted my 25-year old glow Super Hots 60 to electric, and completely re-finished it. It flies smoother than ever, and I can truly say this is one of my best-performing aircraft! If this website allows me to include photos, I will! Super Hots is the BEST !!! Love the Super Hots. I built five of them over the years. Favorite power plant is the YS 61 with a tuned pipe. Its a missile. Its flight envelope is about 5 mph to 140 mph. You can get the plans from RCM or Model Airplane News. Scratch built is preferred because it will be much lighter than the kit version. Easy to build also. If you can find a kit now a days, they are going for $200+!! I'll say though that you can build one from plans very easily. I did a plans built Super Hots and ended up selling it later. It was super nice and light. I was recently blessed with a RTF Super Hots and a NIB kit of the Super Hots as well. I'm going to trace all the kit parts and keep them as templates.....that way, I can always have a Hots!!!! I've got the fuselage. It was a great flying plane. I had an OS 91 Surpass on it. Someone stole the wing out of my garage. Since the front of the canopy was built into the wing, they probably thought they stole a flying wing. That was twenty years ago. The engine went on to power different planes, but I still have that Hots fuselage. Even without the wing its still beautiful. I do miss having unlimited knife edge capability though. I have flown a Midwest Super Hots for years. Couldn't get enough of the plane. Unfortunately, I crashed a few weeks ago. I am looking for a Midwest kit or an actual plane. If you have something let me know. I owned two hots in the 1980's. I often flew my hots inverted at one quarter throttle very low around the field . I did this the entire flight rolling it and looping it. It was awesome to watch .i wish Midwest would produce the hots again!! Join in and write your own page! It's easy to do. How? 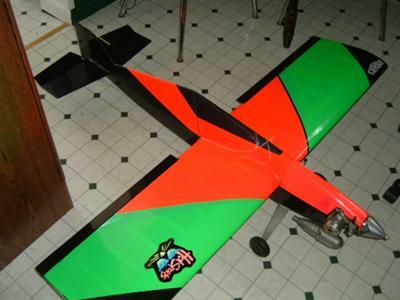 Simply click here to return to The Best RC Sport Airplanes.